HOW CAN BUSINESS INTERSECT WITH CAREER CONNECTED LEARNING? Healthcare represents approximately 12.5 percent f all jobs in the United States and 14 percent of jobs in our state. Healthcare is the second largest employment sector in Spokane, equating to 19 percent of all jobs in the area – over 44,000 workers. The healthcare industry has significant challenges with an aging workforce and national shortages for key positions such as nurses, physicians, first responders, and allied health professionals. Top talent is in high demand – so as a major employer, we need to be creative in our recruitment efforts. What is INHS doing to respond to talent acquisition? At an early age, we are engaging the hearts and minds of T-2-4+. We are building relationships early with the belief that upon certification/graduation/licensure, INHS will be the employer of choice for graduates. We are also creating professional pathways which enable us to pre-fill our known future workforce needs. Let me tell you about Karen. Karen is one of our nurse managers, but that’s not how she started her professional career. Right out of high school she obtained her nursing assistant certification and joined our team. She knew she wanted to advance her career so, with our financial assistance and support, she worked through her nursing prerequisites and was accepted into an Associate of Nursing program. After her first semester in school, she was promoted to a nurse technician at INHS. This allowed her to practice nursing up to her classroom learning level while earning an increased wage. She graduated with her Associate’s degree then pursued her Bachelor of Science Nursing degree. Karen is now managing one of our most medically complex units at St. Luke’s. Moving forward we will be able to assist more employees like Karen with our recent award of the TAP Accelerator – upskill/back grant. We have several traditional programs we engage in such as an all city career awareness day for fifth graders. We are in the classroom with junior and senior high students to present Psychiatry to Podiatry talks (a.k.a. healthcare from head to toe). We have a robust junior volunteer program and job shadow opportunities, as well as formal clinical internships (250 students per year hospital). 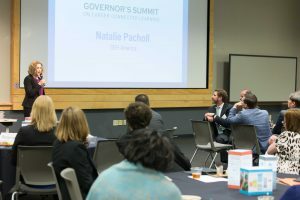 We are partnering with our Workforce Boards, actively engaging in policy advocacy work with Greater Spokane Incorporated, and we are working with local high school Health Science Advisory Boards. We are also participating in several nontraditional and innovative programs such as hosting Business After School and Teach the teachers events. Just recently we formed a partnership with Spokane Valley Tech for an Emergency Medical Technician (EMT) course in the high school, so that upon completion of the course, and after the student’s eighteenth birthday, he/she can test for EMT certification. Here’s my call to action. Ask yourself, do you know your K-12 and T-2-4 partners? If not, make this a top priority. Encourage and support employees to be actively involved in student and teacher development and be mentors. Finally, develop professional pathways to support incumbent workers. I’d like to leave you with a quote from John F. Kennedy: “We set sail on this new sea because there is new knowledge to be gained and new rights to be won, and they must be won and used for the progress of all people.” We have the responsibility to shape our future communities and workforce, so I am asking you to make Career Connected Learning and workforce development a strategic initiative for your business. Businesses need an educated and skilled workforce to compete globally, grow our economy, and create more jobs that pay well. STEM and soft skills are particularly crucial. 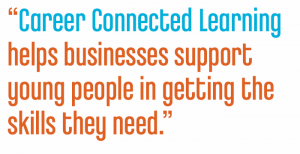 Career Connected Learning helps businesses support young people in getting the skills they need. SEH America manufactures silicon wafers which are the foundation of the electronics industry. 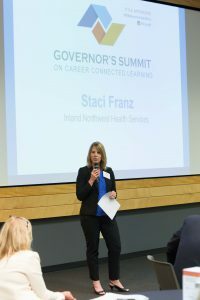 Partnering with Evergreen Public Schools and the Southwest Washington STEM Network, SEH America has hosted over 200 high school juniors and seniors in work site learning internships since 2011. These worksite learning internships develop students’ technical and soft skills through hands-on projects, projects which may teach students statistical process control, 5S, a wide variety of software skills, how to use hand tools, and more. Students participate in weekly meetings to learn foundational skills like email communication, conflict management, and professional networking. These are instructional internships, so students earn both college and high school credit for their 90 hours onsite. Throughout their internship, students are supported by mentors and become respected members of the team. They leave SEH America with increased skills, but more importantly, with increased confidence, knowing they have adults who want to help them succeed. The students have social capital, which is crucial for success. What’s in it for SEH America? This is a learning opportunity for existing employees. Mentoring develops employees’ skills as they learn how to interview, how to train, and how to support someone in generation Z. SEH America employees take great pride in mentoring youth and seeing them grow and learn. They also take pride in their company for offering internships. SEH America also benefits when interns are hired. Around one third of former interns are hired upon high school graduation. Former interns work at SEH America in the IT department, as machine operators, and as team leads running their groups. These young people have living wage jobs that support their families and offer advancement opportunities including an education benefit, which some of these former interns are using to pursue college debt-free. Ideally every student will have an opportunity like this and will have the support, the social capital, and the skills to allow them a good life. If at all possible, businesses should get involved and see what they can do to support these efforts. We are all very busy, and have limited time and resources, but this is important. If your plan is for 100 years—educate children.